1971. Lost in (not space, but) samsara, baby. Tripping out in the redwoods at UC Santa Cruz, drenched in world-weary posing, nihilistic attitude, ironic utterance, biting criticism, artistic pretension, sexual apprehension, anxiety and disdain. And on the turntable? 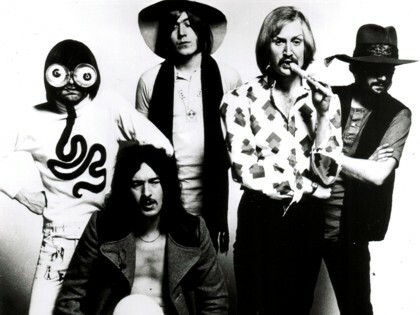 The Bonzo Dog Doo Dah Band, loopy rock anti-heroes, equal-opportunity disrespecters with Dada-ist sensibility and affable good humor. A favorite? “I’m the Urban Spaceman,” chronicle of a young man living the good life on the frontier of the Great Society, free from everything that WE were enmeshed in. So, we thot the whole well-adjusted techno-dude being non-existent thing was way-cool. That went very well with the maximum disdain pose. And totally great to have something over an entire class of social vermin (that we secretly, never to be mentioned, envied as they weren’t losers like us). Interestingly (from my perspective) it was just around this time, and at a Pink Floyd concert where I synchronously met the caustic chaps who had introduced me to the Bonzo’s while waiting in line, that I first, with a small jet-assist from a tab of orange sunshine (link to mp3 of Nick Sand, maker of this legendary psychedelic, talking at Burning Man <-#54>) slipped on a banana peel into deep voidness. As I looked within to find out what the band were doing to my head, my perceptual world became a swirling mandala of light, scent and sound, and I entered another realm. As Roger McGuinn wrote in the Byrds hit 5D, ” I saw that world crumble and thought I was dead, but I found my senses still working.” It was a timeless loca that I recognized instantly, more real than my experience as who I’d formerly assumed myself to be, and my first overwhelming thought was “How could I ever have forgotten about This?” Sadly (or not) however, “I” was definitively not dead, and to my great chagrin and confusion, sometime later (as viewed within the perspective of time) I found myself lying on the floor at Winterland, reabsorbing my life, karma, vasana’s, opinions, likes, dislikes, fears, attachments, etc., etc., with my brother and another friend, like, freaking out. The “me” I returned to after this reality break was all about reveling in how the idea of “the successful personality” in the Bonzo’s Urban Spaceman crumbled under the revelation that “I don’t exist.” And that Me amazingly managed to struggle on for success, for recognition, for respect, for love, for more than another 3 decades, decades of growing psychological sophistication, intellectual articulation, and above all, well-reasoned judgements of “The Other” in all of its myriad manifestations. And now, 36 years later, the phrase “I don’t exist” comes back around as a much deeper revelation, every bit as mind-shattering as vanishing from the world to the strains of Pink Floyd. For me, the bottom-line has been that only with the deepening realization that, literally and unequivocally, the separate persona I conceived myself to be throughout this life (with the occasional reality break quickly taken possession of by the ego) was entirely incapable of solving the problems of “my life.” Those problems were part and parcel of the Me, and could only lose their sticky reality through the Me’s dissolution. As Einstein said, “The significant problems we have cannot be solved at the same level of thinking with which we created them. The real twist here is that the level in which “we” created our situations was whipped up out of thin air in the same deft movement of inversion that created what has been (also by Einstein) called “an optical illusion of consciousness” – the imaginary me. Once we drink the Kool-Aid (and I’m not talking here about the electric kind) and invest “our” identification into separation from That which we always, couldn’t be anything else, are, you can put a fork in us. I could be clever and sophistrickated, adopt miles of designer attitude and write an award-winning essay on the Void, but nothing could ever solve the problem, compensate for the underlying dissatisfaction, or begin to recapture the innate quality of effortlessness and ease that resting in my true inner nature opens up. Instantly.